Emily Daughenbaugh | Emily’s main goal for season is to beat her current times and becoming better. She would also like to be a good teammate and is trying to make the regional team. Emily is most looking forward to becoming closer to her teammates and getting to swim. Cat Dooley | Cat’s big goal is to make it to State! She’s also involved in the Lincoln Marching Band. Chloe Dougherty | Chloe’s goal for season is to drop time on her 100 Breaststroke. She’s also involved in band, tumbling and robotics. Madelyn Dowling | Maddie’s a Rails swimmer and diver. She is aiming to learn 11 dives and to swim the 50 Free in 30 seconds (or faster). She’s most looking forward to creating awesome friendships with the members of the team. Kelly Klinge | Kelly is a swimmer and diver for the Rails. Her goals this season include dropping seven seconds in the 100 Backstroke and being able to dive in a meet. She’s also involved in softball, basketball and track and field. Kylie Lynch | Kylie’s big goal for this season is to improve her 200 Free time. She’s looking forward to having fun with everyone on the team. Kalani Mangin | Kalani’s main goal for this season is to swim her 100 Back in a 1:09. She’s most looking forward to the taper part of season. Chloe Pearson | Chloe is a varsity diver for the Rails. 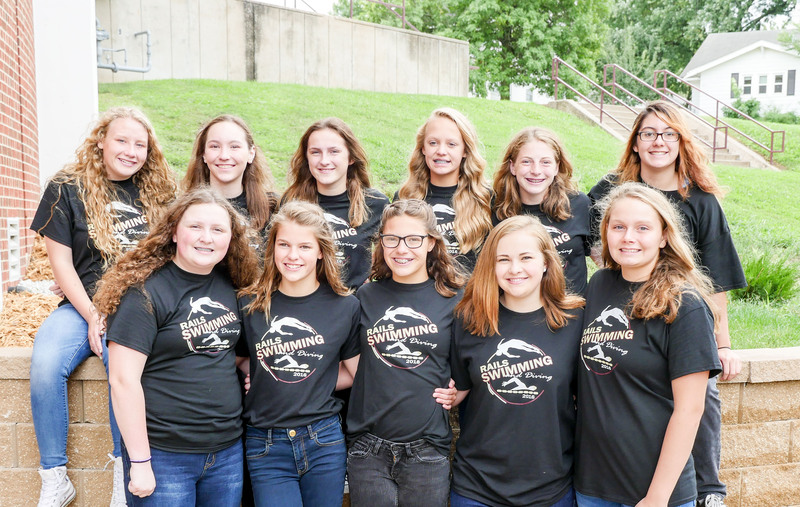 She aims to make it to State while also improving her dive scores and increasing the degrees of difficulty on her dive list. Chloe’s also involved in soccer. Ali Poli | Ali’s main goal for season is the make the Rails Regional team. She’s looking forward to bonding with her teammates this season. Ali is also involved in track, softball and leadership and is one of our Norwalk swimmers. Grace Twelmeyer | Grace is a Rails diver. Her big goal is to compete in as many meets as possible, meaning she’ll need to several six dive lists. She’s also involved in volleyball, softball, basketball and tennis. Diana Ward | Diana’s goal for season is beat her current best times. She’s also involved in soccer. Diana is most looking forward to the team activities and getting better at her swim technique.